Years ago, when I first caught a glimpse of the then-unknown Younghusband brothers in a televised low-key international tournament over at the Panaad, my sharp coach’s eye immediately took note that it was the younger one – Phil – who was technically better between the two. The older brother’s touch was a tad on the heavy side; and did he just not tend to err on the wrong side of petulant. That would be James, of course. There was this other televised match in another low-key tournament – and I am frank enough to say that I cannot recall which – when the very same Younghusband was so ruefully out of shape – or overwhelmed by the climate – that he played the last quarter of the match with hands on hips, frequently bent down at the waist catching his breath and so obviously wasted as a performer. 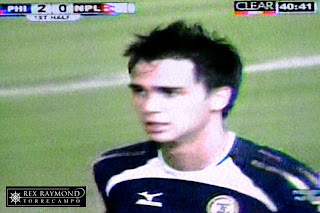 In the ensuing years, on the rare occasions that matches of the national team were broadcast – frequently by cable television stations as the local ones could not be bothered to air anything beyond basketball games and telenovelas – the more I saw of James Younghusband, the more I thought he was too sulky for his own good. In contrast to Phil, who has a pleasant eager-to-please face, the older James’ face always seemed to have an ugly scowl pasted all over it. What an unhappy young bugger, I would think to myself. I have had the sort play under me before; and I do not take kindly towards petulance. Frequently, the petulance was aimed at a local team-mate’s misplaced pass or wrong move – which rather tended to be frequent because the locals could not really be on the same page as somebody who once suited up in the royal blue of Premiership side Chelsea FC. Or, probably at an opponent who came in a tad overzealously with the sort of tackle that would have seen straight red in Europe. All this time, although the national team had not yet exploded in the country’s radar of awareness, the two Younghusbands kept more or less just below it. Not so much for the football, mind. More for tarpaulin wall good looks that frequently result from the genetic mix of Filipino and Caucasian chromosomes. But that was mostly just Phil. On the cover of some teenage magazine. Modelling this new pair of jeans. Perhaps guesting in some sports talk show. James? Yeah, we saw him. But not as frequently as we saw Phil, who had become a subject for gossip not only among giggly teenage girls but also among young housewives waiting at school front gates to pick up their children. Then, the Suzuki Cup came along; and suddenly not only the Younghusbands but the entire national football team had become hot property. There was still some petulance in James – particularly when substituted by Simon McMenemy in one match – but noticeably less so. Was the young man finally maturing as a player? Perhaps it helped his state of humour that there were so many more technically-skilled Europe-based players in the squad; as opposed to the early years when even the half-bloods were not really all that much better than the locals? In the public eye – naturally – it was still Phil who flourished in the team’s newfound popularity. The lad even contrived to shock a female anchor of a primetime news show by responding to a question asked in English with stuttering but nonetheless intelligible Tagalog. Celebrity just came so naturally to the lad! James? Even when the two brothers were interviewed together, he just mostly let Phil do the talking. Although I had an issue with the older brother’s often sulky demeanour, I also began to realize that celebrity meant less to him than the football. Belatedly, I started to understand that what I initially thought of as petulance was, in fact, passion not only for the beautiful game but also passion to do well in each and every game. Then, Michael Weiss came along. I have not, as yet, made my mind up about the German. He gets the thumbs up from me, though, for the way he has turned James Younghusband from a potentially young former Chelsea reserves has-been to a fit, mature, competitive and genuine international football star. I know the two brothers are different types of players; and that the two complement rather than compete against each other. I also know that they play in different positions and that Phil has had a difficult run with injuries. But I will go so far as to say that James, in a way, has actually become even better than Phil! In the World Cup run, in particular, while like everyone else I celebrated Phil’s goals, it was the understated performances from James Younghusband that I quietly celebrated more. Even in the cauldron that was Kuwait, he was delivering crosses into the opponents’ box, tracking back to help the rightback play tight against the left winger, working tirelessly to close passing lanes and hurling himself into brave and potentially injurious sliding tackles. This was a totally different proposition from the young James who played with hands on hips many years earlier. Gone, too, was the petulance. He still occasionally carried on running feuds with Ian Araneta; but I did not really mind because the latter, anyway, is the sort who can make a man with a full mane of hair lose all of it inside 90 minutes. Everyone would have forgiven the brothers after their recent loss of their beloved mother if their performances in the recent Long Teng Cup fell below the standards that they themselves had set. Yet, while at times Phil looked out of sorts in Kaohshiung, James just carried on where he left off after the Kuwait game at the Rizal Memorial. Even the tantrums at Araneta’s frequent clumsiness seemed to have disappeared! Last night, in that lively encounter against the Gurkas from the Himalayas, I celebrated Phil Younghusband’s opening goal by going to the fridge for a can of cold beer. Nepal was so poor, anyway, and I would have been surprised had they scored against us. When James scored the second, I nearly dropped the can because I just had to clench my fist and raise my arm. That was the James Younghusband who just scored, for crying out loud!